This part waterfall, part cascade, is also known as the Upper Falls of the Swift River (as opposed to the Lower Falls, of course ). Ok, the short of it is that Rocky Gorge is really nothing to write home about. 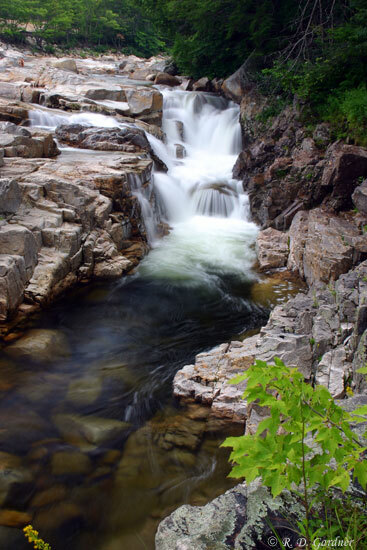 The positive side is that the waterfall is easily accessible from Route 112, also known as the Kancamagus Highway. It is certainly a popular spot. Parking is nearby and people are plentiful. It just happened to be on our way to Sabbaday Falls, a much nicer waterfall, so we stopped to take it in. 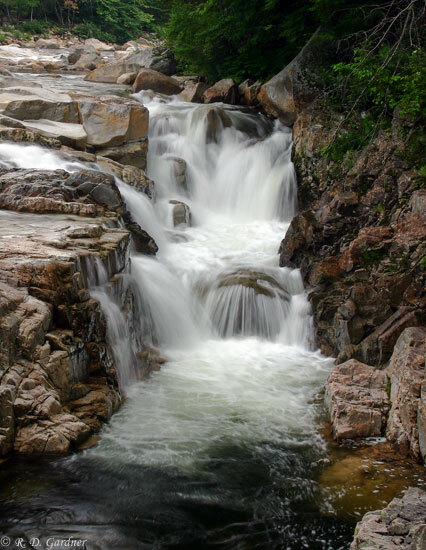 The waterfall is located off of the Kancamagus Highway 9 miles west of Conway, New Hampshire or 26 miles east of Lincoln. The parking area is easy to spot. Just look for a bunch of cars. The area is also called the Rocky Gorge Scenic Area. The waterfall is 0.1 miles downstream from the parking area and is a "no brainer" to find. If possible try to get here early, late, or on an overcast day. This is an exposed area so your main problem here is light. I tried to find some foreground objects to make things a bit less drab but only had limited success. The granite rocks and lack of nearby foliage don't make this the most photogenic waterfall in the world. I like to blur the water in most of my photos but the high water volumes here might look good with faster shutter speeds as well. For slower speeds you will need a tripod. A 28-70 zoom lens should work nicely here. I always use a polarizer and here was no exception. A slightly bluish cast resulted which I corrected with Photoshop. Some polarizers now come with a warming filter "built in" to correct this but my filters are standard glass. Color casts are easy enough to fix later.